This week we are featuring Megan Gallagher. 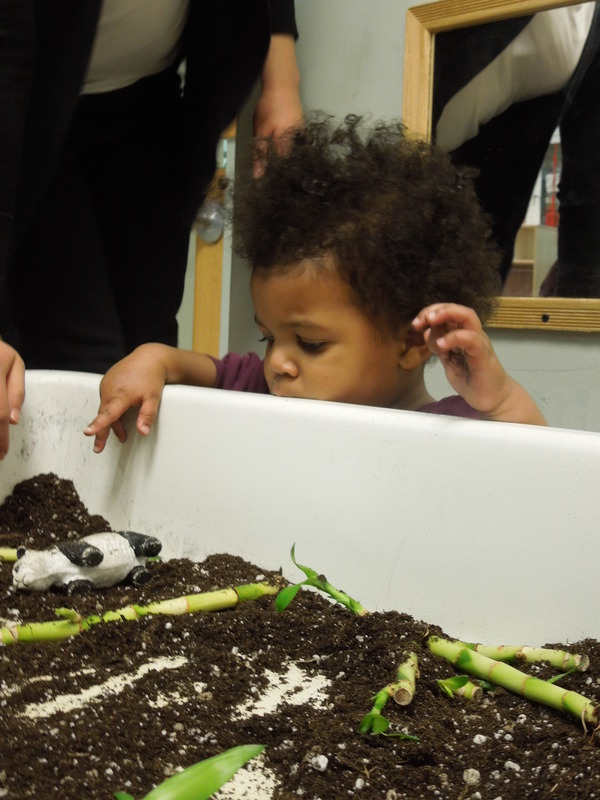 Her two year old classroom was learning about the animals and decided to spend the day learning about pandas. Below you will find a reflection from Megan and images from her lesson. Our toddler class had been discussing animals for several weeks. This lesson was specifically on giant pandas. We started the lesson in the classroom with a sensory activity. 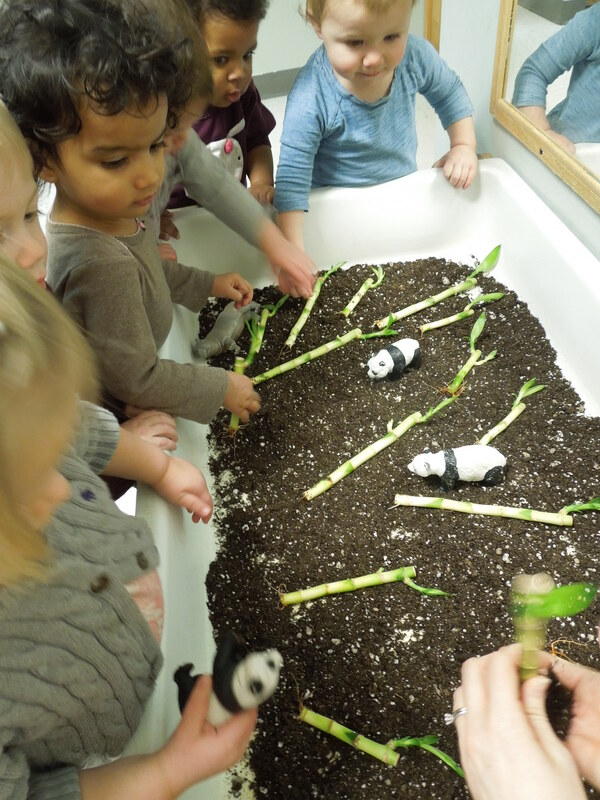 I created a “panda forest” in the sensory table with bamboo, dirt and panda figurines. The children were encouraged to explore the items in the sensory table while we discussed pandas. We had been talking a lot about how pandas eat bamboo and many of the children enjoyed pretending to feed the bamboo to the panda figurines. 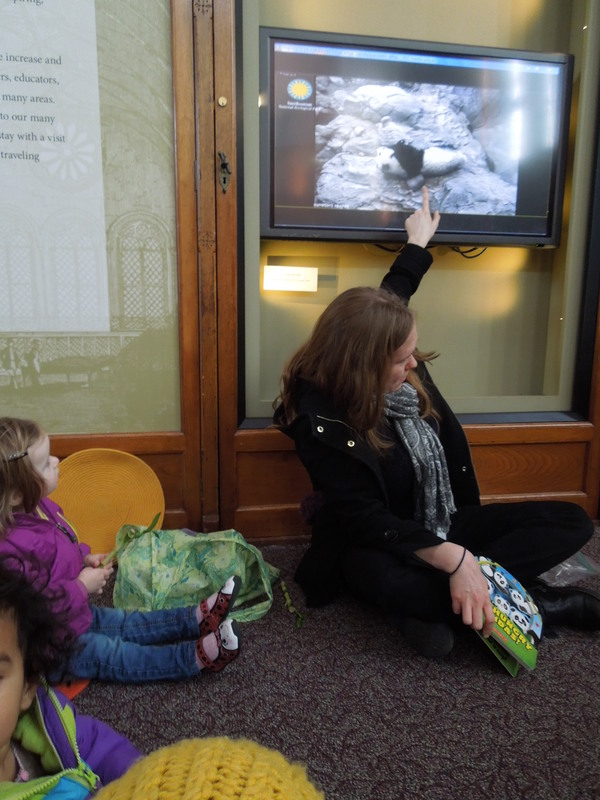 We then took a walk to the Smithsonian Castle to see the “Panda Cam” they have set up that live streams video from the pandas at the National Zoo. We had a special circle time at the “Panda Cam.” In addition to our daily circle activities, each child was given a piece of bamboo to hold while we read two books about pandas. The first book was Five Hungry Pandas, which is a counting book about pandas eating bamboo. The second book we read was My Panda Book which features photographs of pandas engaged in different activities and encourages young readers to consider what the pandas are doing on each page. I wanted the children to take away the concept that pandas are real animals that engage in behaviors unique to them. I also wanted to give the children many different ways to contemplate pandas, so that the concept they formed would be as complete as possible. In addition I wanted to make sure that my lesson had a sensory component and gave the children the opportunity to interact with some of the real objects we have been discussing. I was happiest with the sensory exploration part of my lesson. Giving toddlers the chance to touch and engage with different textures is critical for their development and I am always looking for ways to incorporate sensory based activities into my lessons. I was also happy that the kids were able to see and play with real bamboo. I like to involve some of the real objects we are discussing in my lessons whenever possible. I feel it gives the kids the best opportunity to fully understand a concept. Megan began her lesson with a panda themed sensory bin. 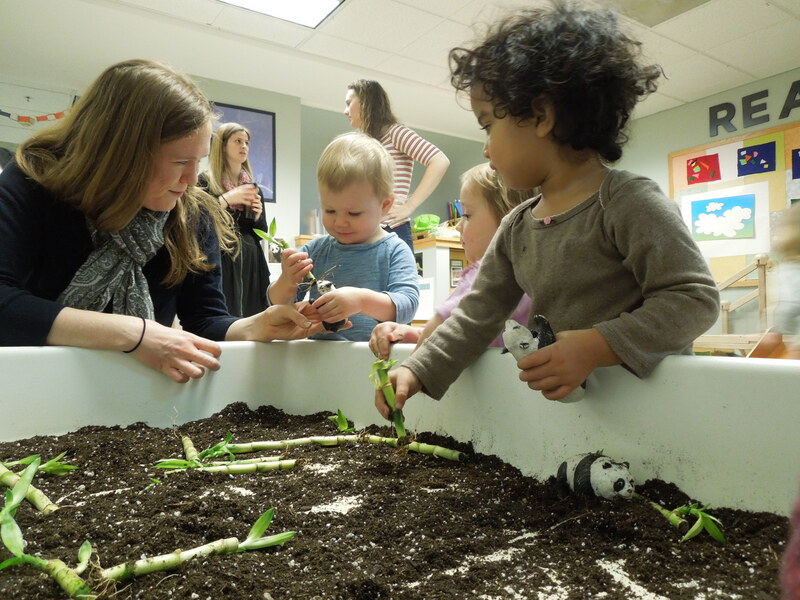 She added live bamboo, organic soil, and small plastic pandas for the children to explore. 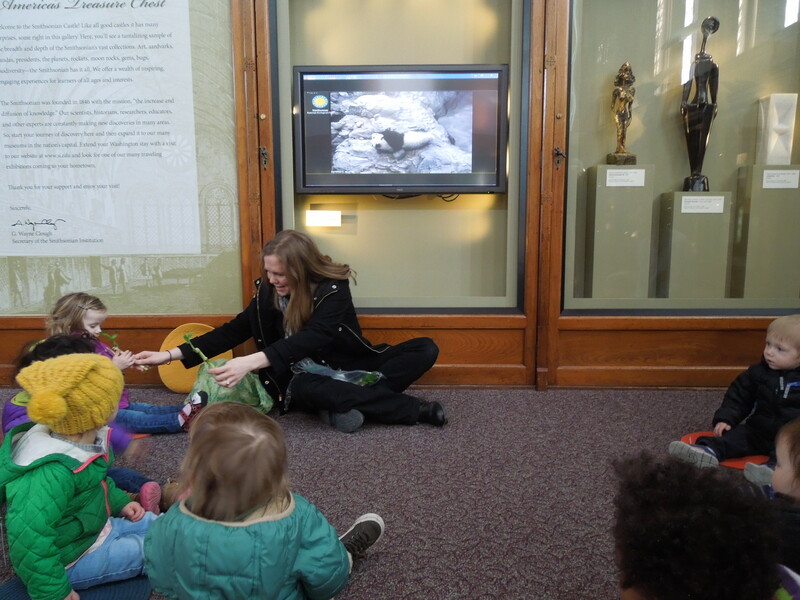 As they played, Megan explained that pandas love to eat bamboo and the children began feeding it to their pandas. The children loved the sensory table! Since there are no actual pandas on the national mall, Megan decided to take the group to the next best spot for viewing pandas: the Smithsonian Castle. The Castle offers a live stream of the giant panda enclosure at the National Zoo. You can also access this camera on the National Zoo website: http://nationalzoo.si.edu/Animals/WebCams/giant-panda.cfm. To add a hands on component to her lesson, Megan brought along a piece of bamboo for each child to hold and explore during their visit. Megan also read two different books about Pandas: Five Hungry Pandas by Alexis Barad-Cutler and My Panda Book. The class enjoyed comparing the images of pandas found in the books and on the screen. This class had a wonderful time learning about pandas! Be sure to check back for our Teacher Feature next week! 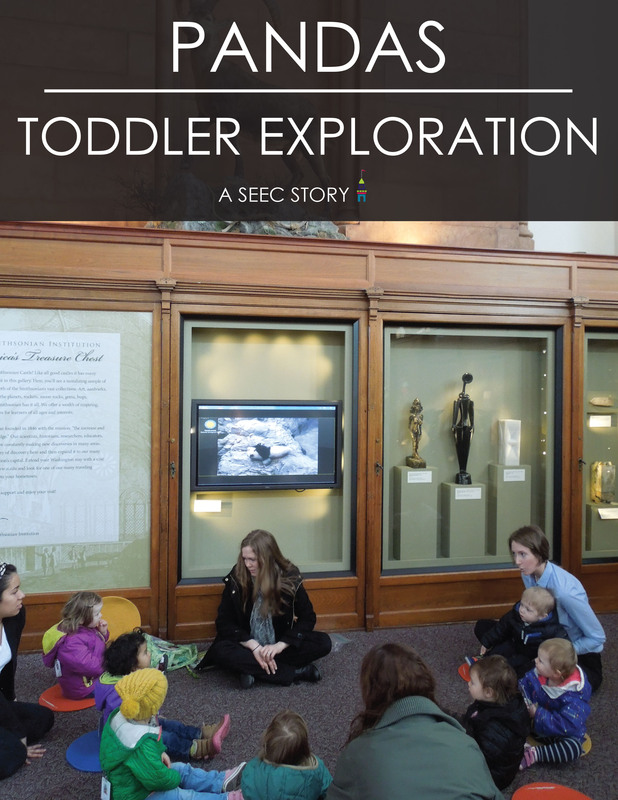 This entry was posted in Early Childhood Education, Museum Education and tagged Animals, children, Early Childhood, learning in museums, Museum Education, museums and early learning, Object-based learning, pandas, teacher, Teacher Feature, zoo. Bookmark the permalink.